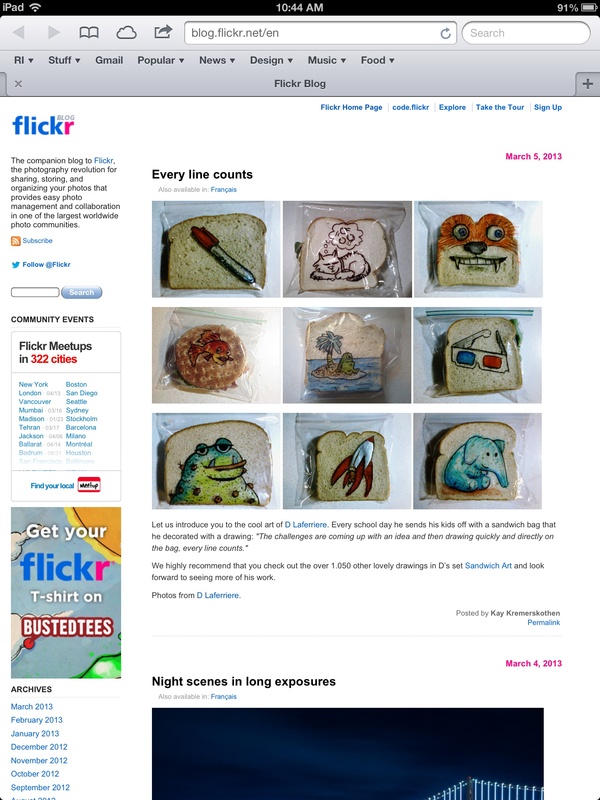 Today, March 5, 2013, Flickr featured my sandwich bag art on their blog. The tile is “Every line counts” and the beginning of their post is “Let us introduce you to the cool art of D Laferriere.” Thank you Flickr! My two sons have been getting these in their lunches since May of 2008. And I don’t sketch out something first. Something pops into my head and I begin to draw. Each mark on the bag usually can’t be easily corrected so yes “every line does count.” They don’t take long to do, a couple of minutes usually, occasionally five minutes. All the comments about my bags are awesome. Thanks.